Missouri has what Indiana doesn’t…fishing in the winter; OK…I know that you might be able to ice fish on occasion or during a warm winter there are still some open waters, but for good trout fishing…set your sails for Missouri. Harrison, my dad and Frank Terkhorn did exactly that this past week as we loaded up my Suburban and drove the 400 miles to Bennet Spring to take in some catch and release trout fishing. 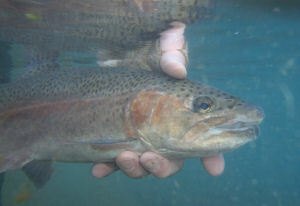 I’ve written about it several times before but Missouri has four trout parks that close up from November through February…except for catch and release which occurs Friday to Monday each week. It might be the best bargain of the year as it doesn’t cost anything except for a non-resident fishing license. The hours are 8am to 4pm and depending upon the weather it can be crowded…or you might just have the place to yourself. 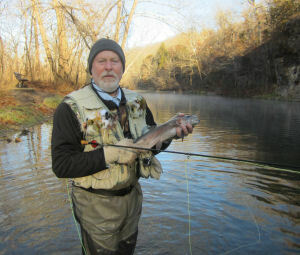 This past Friday the temperature soared to 47 degrees and that brought a few folks out but not so many that you couldn’t find your own part of the stream and that is exactly what I did as I jumped into the cool 56 degree water and headed downstream, 5 weight fly rod and crème wooly bugger in hand. Two hours in, I had landed a good twenty trout and had to grin at how perfect the day was! By 4pm we were all back at the duplex which would be our home for the next three nights. If you are looking for an excellent place to stay at a very reasonable price…give the good folks at Bennet Spring a call and they will set you up in one of the 6 duplexes that stay open through the catch and release season. Where else can you comfortably sleep up to 6 and be less than a hundred feet from the stream? Day two found me up early and on the stream as the 8am horn sounded. I stepped into the stream with my new Christmas gift, a GoPro camera , strapped to my chest and made a cross stream cast…a few strips, then bang first fish of the day…a nicely colored rainbow trout. As the morning progressed my olive wooly bugger was certainly the fly of the day as I had one of the best days I have had at Bennet; I topped it off by landing an 18 inch buck rainbow just below the dam in zone 2. Harrison was my wing man and was able to snap a few photos, then was able to video me releasing the big fish underwater, it made for a beautiful image of this very nice fish. (NOTE: To see the GoPro video footage, click here). The two of us then fished together downstream about ¾ of a mile until we met the Niangua River. It was a special morning as I am not sure how many of these days I will have left with the oldest; Harrison is about to start his student teaching up in Chicago and when finished will probably be off to the west and off to the rest of his life. Through the years the two of us have golfed, hunted and fished over a lot of ground and losing my ‘wing man’ isn’t something I am looking forward to; but I also know it is inevitable and as a parent I am happy for him and will support him wherever his endeavors lead him…who knows…I might just have to plan a quail hunting trip out in Arizona in the near future! As I sit here on Saturday night writing this column I am reminded of why I make these trips; not only have we had a great day of fishing, a great meal, been a part of spectacular scenery…but listening to the different stories passed around by all of us, especially my dad makes it all very special. I have said it before many times but the best friends I have are all outdoors people and that makes sense because there is a bond shared between men when you fish, hunt or just spend time in the outdoors…and tomorrow, well it is a new day and we get to get up and do it all over again. While Harrison and I were walking, talking and fishing our way downstream I happened to look up at the right time and there before me was a brilliant sight…a mature Bald Eagle flying right at us. I can clearly see why it is our national symbol, the white head and tail feathers radiated light and it seemed to glide easily as it pulled up and landed atop a big Sycamore adjacent to the stream. Nothing was said but we both stopped and watched with respect as this majestic creature looked down upon us. You don’t find scenes like this in front of a TV; if you are looking for a great New Year’s Resolution, look no further than nature, get out there and get going, make 2014 the year that you ‘re-connect’ as we all Enjoy the Great Outdoors.